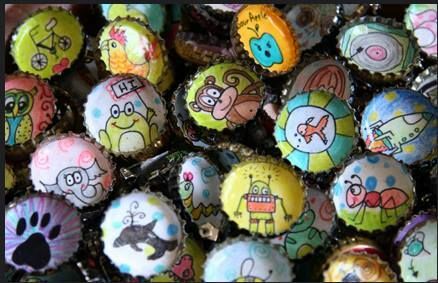 “Cranky Pickle Art” consists of colorful, fun and unique original illustrations inside bottle caps re-purposed into jewelry, magnets and pinback buttons. 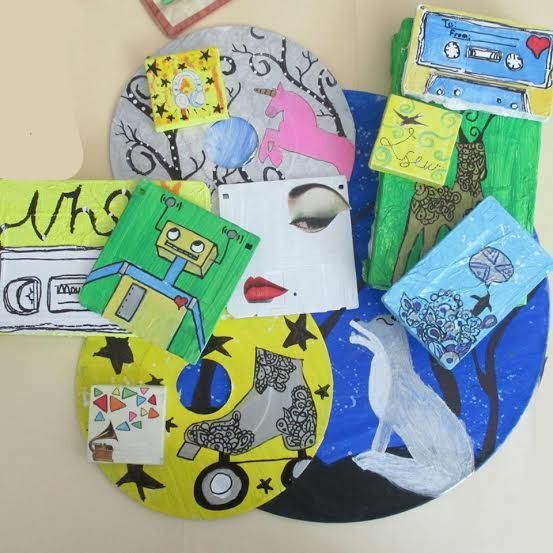 Also, Home décor items feature acrylic and mixed media paintings made from re-purposed discarded media devices, VHS tapes, floppy disks, cassettes and vinyl records, and mini canvases. At the age of five, Jessica White, AKA Cranky Pickle, began drawing and painting to express her vision of the world. Motivated by a life-long passion for drawing, painting and designing, she graduated from the IIA in Chicago with a Bachelor’s Degree in Fine Art. She began her art career making unique re-purposed Vinyl record art and a few bottle cap crafts. Figuring other people would like her art, POW! Cranky Pickle was born. CrankyPickle.etsy.com sells her quirky original jewelry and home decor items. Cranky Pickle also exhibits at Chicago street and craft fests.